We had been considering a new car for about 6 months, and specifically been thinking of a Dodge Charger. I had been riding my motorcycle almost every day this summer to work. Then on a Wednesday about 3 weeks ago, we had a very unusual weather event. About 2:30PM in the afternoon, I heard thunder! In Northern California, rain is exceedingly rare in September, so I high-tailed it home, and worked there for the rest of the afternoon. We were taking my wife’s mother to dinner that night, and I knew there was a dealership right around the corner from the restaurant. While my wife and her mother were chatting at the table, I whipped out my iPhone, and checked out the dealer’s inventory, online. I found one with the new Pentastar V6 and 8-speed automatic that looked like what I wanted, so I talked them both into going over to the dealer’s after dinner. We got there, I showed the salesman the car (I had already been to KBB to know what I could do in a deal), and the next thing you know, we’re out for a test drive in a 2012 Dodge Charger Blacktop – aptly named because everything about this car is black, including the grille and the 20″ wheels. In a word, it looks badass! 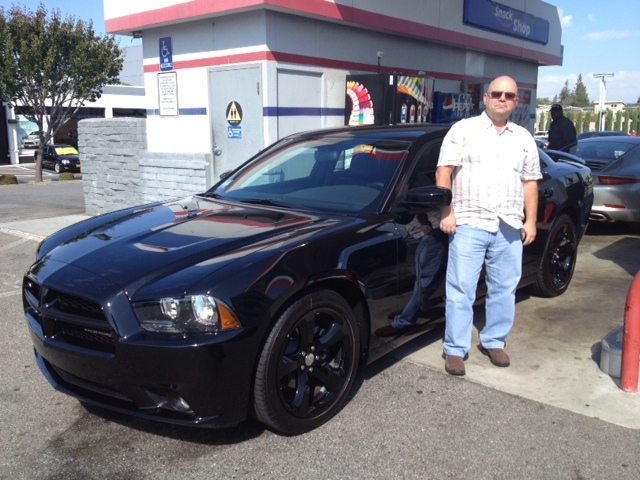 My new 2012 Charger Blacktop. Wow, Curt–congrats! Can’t wait to see it in person.